Men's squash captured the national championship against Trinity College at the season-ending tournament of the College Squash Association. The women (pictured above) will vie to repeat as national champs next weekend at Princeton’s Jadwin Squash Courts. With a resounding 9-0 thumping of Trinity College, Harvard’s men captured the national championship at the season-ending tournament of the College Squash Association (CSA), which wrapped up February 16. The win capped a perfect 18-0 (7-0 Ivy) season. This was Harvard’s thirty-first such title but the first one since 1998—two head coaches ago. It was head coach Mike Way’s first national title with the men; his women took home the CSA championship last year. Harvard’s demolition of Trinity’s varsity was presaged by the Crimson’s 7-2 thrashing of the Bantams in Hartford two weeks beforehand, but the shutout surely surprised many in the huge crowd that thronged to Harvard’s Murr Center, the site of this year’s CSA tourney. The match that put Harvard over the top came at the number-two position, where captain Brandon McLaughlin ’14 came back from a 2-1 deficit and faced down two match balls before overcoming Trinity’s Karan Malik, 12-10, in the fifth game. His teammates mobbed him as he came off the glass-enclosed “show” court, where the top three matches took place. At the number-one slot, Ali Farag ’14 (profiled in Harvard Magazine along with the Crimson’s top woman player, Amanda Sobhy ’15) continued his undefeated season with a dazzling array of artistic shots in his last home match, vanquishing Miled Zarazua, 11-1, 11-5, 11-5. Before the final, Farag received the sport’s highest honor, the annual Skillman Award, presented the collegiate player who has best exemplified both athletic achievement and good sportsmanship. The Crimson women, undefeated and also ranked first in the nation, will vie to repeat as national champs next weekend at Princeton’s Jadwin Squash Courts. 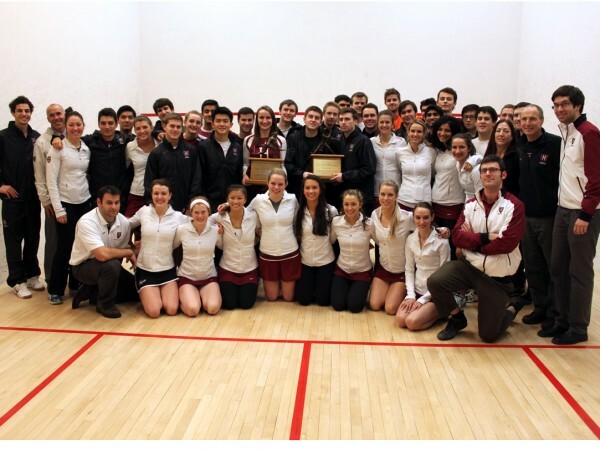 The college squash season ends with the CSA’s national individual championships at the University of Pennsylvania from February 28 through March 2.